Grigori Grabovoi is a Doctor of Physical and Mathematical Sciences, Academician, the author of the discovery of creating field of information and original works on the forecasting of future events, their control, correction; he is the author of the Teachings “About salvation and harmonious development”. He was born on 14th of November 1963 in Kirovsky village (Bagara village), Kirov district, Chimkent oblast of Kazakh SSR. In 1986 he graduated from the faculty of applied mathematics and mechanics of the Tashkent State University named after Lenin, majoring in mechanics. After graduating from the University Grigori Grabovoi worked at the Design Bureau of the city of Tashkent that was a subsidiary of Moscow Ministry of Mechanical Engineering, which was engaged in development and testing of space technologies. In 1991-1992, for the first time in the world, on official and scientific basis Grigori Grabovoi on the instructions of the management of the National Airlines of Uzbekistan carried out more than 360 forecasts on diagnostics of the state of aeronautical engineering with 100% convergence of the forecasts with the facts in rigid working conditions of operations of the aircraft fleet of Tashkent OJSC, of Aircraft Repair Plant No. 243, and of the Flight Safety Inspection of the National Aircraft Company of the Republic of Uzbekistan. From January 7, 1993 to September 1, 1993, Grigori Grabovoi worked as an expert in the Centre of Information and Computing Services of the National Airlines of the Republic of Uzbekistan where he continued to use the extrasensory diagnostics. The proving base of 100% reliability of all aircraft equipment forecasts and diagnostics is included in “The Practice of Control. The Way of Salvation. Volume 1”. In 1994, Grigori Grabovoi travelled to India, Chhatarpur Temple where Shri Sant Baba Nagpal Ji, recognized during his life Holy, blessed Grigori Grabovoi saying he would pray for him, and predicted that Grigori Grabovoi would use his high energy and psychic abilities through the event control for the benefit of people not only in his country but also around the world. The same year a famous healer, forecaster and clairvoyant Yuko N. Labeau expressed conviction that with such abilities Grabovoi was just obliged to assist not only his country but also the entire planet. On October 27, 1995 the great Bulgarian seer Baba Vanga after a 50-minute conversation with Grigori Grabovoi predicted that within 20 years he would achieve everything he had planned, and would realize in practice his system of nuclear and environmental safety on the planet, human life extension, non-dying, and expressed her belief that Grigori Grabovoi, with his phenomenal qualities had to necessarily continue to expand the scope of his abilities in all areas of life. From 1995 until 1997, Grigori Grabovoi cooperated with the Control Center of Space Flights of the Russian Federation, helping to solve successfully the emerging problems aboard the space ship in diagnostics of the orbital complex “Mir”. In the presence of the Deputy of the Flights Leader of this organization, Grigori Grabovoi accurately determined the places of break of thermal insulation in the outer covering of the space station and indicated the scratches and cracks in the complex body. This prevented a possible emergency that could occur due to planned afterburner load on the on-board engines. Grabovoi insisted that such actions were inadmissible until the elimination of the indicated defects. There is another example of Grigori Grabovoi’s work on diagnosing space technology: diagnosis of all engines of the USA “Atlantis”. In this case, he gave the real technical picture that was confirmed in practice that was the change of settings of the bottom engine. We should note that Grigori Grabovoi carried out this diagnostics in a matter of seconds being outdoors and communicating with the Control Center of Space Flights over the mobile phone. The competent Commission of experts concludes “Based on comparison of the forecasts of Grigori Grabovoi with practice, all the forecasts of Grigori Grabovoi were hundred percent confirmed. One hundred percent confirmation both of every forecast, and of the total volume of the task makes it possible to conclude that when Grigori Grabovoi diagnoses the space technique only through his clairvoyance, he instantly provides a 100% confirmed forecast on the total volume of the task. It follows from the described facts that it is necessary to use clairvoyance in the prevention of malfunctions and accidents in space technology”. (The Practice of Control. The Way of Salvation. Volume 1. Page 239). Grigori Grabovoi created a new science. The science of Grigori Grabovoi is a fundamentally new area of knowledge, affirming the way of development in continued compliance with the laws of creative development of the world. Fundamental laws of creative control of each object of information in direction of salvation and rescue from destruction were discovered and confirmed in practice for the first time. For the first time the dependences, which proved in practice that the change of perception could be transformed into information in all the systems of realty, were defined mathematically. for the principle “The Diagnostics of an Object by the Methods of Orthodox Mathematics”. On December 24, 1997, he received Certificate-License for the discovery of “Reproducing self-evolving systems reflecting external and internal areas of a variety of creating spheres”. On January 24, 1998, Grigori Grabovoi was awarded the title “The best healer” in Bio-energetic-informatics and forecasting. On March 9, 1998, the Russian Academy of Natural Sciences (RANS) based on its Charter elected Grigori Grabovoi a full member of RANS in the section of “Noosphere knowledge and technologies”. On June 10, 1998, Grigori Grabovoi was elected a full member of the International Informatization Academy. On June 10, 1998, in recognition and certification Grigori Grabovoi was elected an Academician of the International Informatization Academy. The International Informatization Academy is a non-governmental organization and an associated member of the United Nations Organization (UNO) in the common consulting status of the Economic and Social Council of the United Nations Organization (www.iia.ca). On August 10, 1998, the Italian Academy of Economic and Social Development awarded Grigori Grabovoi the title of Academician in a sign of the highest expressions of official recognition of his eminent virtues, high moral qualities, constant execution of his civil duty and following the most noble ideals, which gave him full right to take a worthy place in the society. In August 1998, the New-York Academy of Sciences elected Grigori Grabovoi a full member of the Academy. From September 24, 1998, Grigori Grabovoi is an honorary member of the Academy of Cosmonautics named after K.E. Tsiolkovsky (Certificate No. 1095) and later a member of the Academy of Cosmonautics named after K.E. Tsiolkovsky. On October 10, 1998, the International Academy of Nature and Society Sciences awarded Grigori Grabovoi the medal of the Academy “For the merits in the revival of science and economy of Russia”. On October 20, 1998, the International Academy of the Authors of Scientific Discoveries and Inventions awarded Grigori Grabovoi the silver medal “For Merits in Innovations”. On October 25, 1998, he received the Diploma of Order of Malta. On October 29, 1998, the Russian Academy of Natural Sciences awarded Grigori Grabovoi the scientific degree of Doctor of Russian Academy of Natural Sciences. On November 4, 1998, the International Inter-Academic Union in recognition of personal merits awarded Grigori Grabovoi the honorary title of “Grand Master of the World Sciences and Education”. On November 20, 1998, Grigori Grabovoi received a certificate of membership in the Professional Psychotherapeutic League. On December 2, 1998, the International Academy of Nature and Society Sciences awarded Grigori Grabovoi the medal for “Development of Culture and Art”. On April 16, 1999, Grigori Grabovoi was awarded the diplomas of the World Distributed University (WDU) in Brussels on the assignment of the scientific degree of the Grand Doctor of Philosophy and the scientific degree of Full Professor. On April 20, 1999, by the Decision of the Top Certification and Qualification Committee Grigori Grabovoi was awarded the academic degree of Doctor of Technical sciences. The essence of his thesis was set out in the publication “Research and analysis of fundamental definitions of optical systems in prevention of catastrophes and forecast oriented control of micro processes” in scientific technical collection “Microelectronics”, issue 1(153) Moscow Central Scientific Research Institute “Electronics” 1999. On April 20, 1999 by the Decision of the Top Certification and Qualification Committee Grigori Grabovoi was awarded the academic title of Professor on the specialty 05.02.21 “Safety of Particularly Complex Objects”. On May 12, 1999, Grigori Grabovoi was elected a full member (Academician) of Academy of Medical Technical Sciences of the Russian Federation. On May 25, 1999, Grigori Grabovoi was awarded the highest award of the International Inter-Academy Union “The Star of Vernadski for the Merits in Science”. On June 11, 1999 by the decision of the Presidium of the International Academy of Integration of Science and Business (IAISB) Grigori Grabovoi was awarded academic degree Doctor of Informatics and Management of IAISB. On June 26, 1999, Grigori Grabovoi was awarded the Knightly Order of St. Stanislaus. On July 15, 1999, by the decision of the Higher Inter-Academic Certification Commission Grigori Grabovoi was assigned the academic rank of Professor in “Analytical and Structural-Analytical Devices and Systems “. In July 1999, Grigori Grabovoi lectured at the Centre of education and training of specialists in the field of modern technologies in the prevention and elimination of emergencies at the Ministry of Emergency Situations Agency on monitoring and forecasting of emergencies. (Letter of M. Shahramanian to the Higher Inter-Academic Certification Commission of 23. 07. 2013). On August 24, 1999, by the decision of the Presidium of the International Academy of Integration of Science and Business (IAISB) Grigori Grabovoi was awarded the academic title of professor of the IAISB in “System Informatics”. On February 17, 2000, by the decision of the Presidium of the International Academy of Authors of Scientific Discoveries and Inventions Grigori Grabovoi was elected a full member of the Academy. On March 16, 2000, by the Decision of the Presidium of the European University Grigori Grabovoi was awarded the title of Doctor of Sciences of the University in “Technical Sciences”. On March 5, 2000, Grigori Grabovoi was admitted to the “Club of Air Travelers” for substantial contribution in the development of superlight aviation. 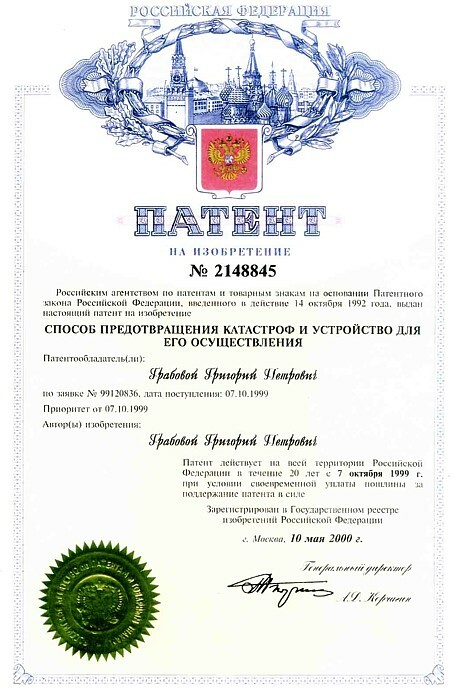 On May 10, 2000, Grigori Grabovoi registered the patent for invention No. 2148845 “Method for Prevention of Catastrophes and Device for its Realization” (www.ggrig.com/Patent2148845.jpg). The description of the patent is available in the Internet on the official website of the Federal Agency of Russia on the Intellectual Property, Patents and Trademarks www1.fips.ru. The invention can be used for the prevention of different catastrophic phenomena both of natural character, such as, for example, catastrophic earthquakes, and of man-made disasters, particularly at production sites. On July 27, 2000, The Russian Academy of Natural Sciences awarded Grigori Grabovoi the honorary title and badge the “Knight of Science and Arts”. On December 4, 2000, The Russian Academy of Cosmonautics named after K. E. Tsiolkovski elected Grigori Grabovoi a full member (Academician) of the Russian Academy of Cosmonautics named after K. E. Tsiolkovski. 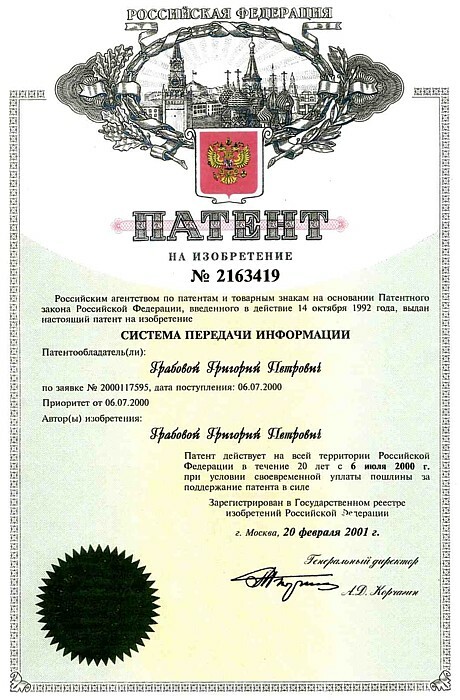 On February 20, 2001, Grigori Grabovoi registered patent for invention No. 2163419 “The Method of Transmission of Information” (www.ggrig.com/Patent2163419.jpg). The invention refers to the field of communication technology and can be used in the systems of transmission of information with the use of wireless communication between the transmitter and the receiver of the information, predominantly when information is transmitted over long distances and in the systems of prevention of catastrophic processes of different origin. Devices based on the patents of Grigori Grabovoi intensify the effect of human consciousness and are a peculiar training, which trains consciousness up to the level, at which it will be able independently without devices to cause spiritual processes, which would provide regeneration of the cells and of the whole human body. On March 28, 2001, Grigori Grabovoi registered his author’s Curriculum of the training course “The Technologies of Anticipatory Forecast and Safe Development” in the Ministry of Natural Resources of Russia, Department of Additional Professional Education of the Ministry of Education of Russia and in the International Center of Educational Systems (ICES) of UNESCO. On September 21, 2001, he was appointed the Chairman of the Commission on the System Controlling Forecasting at the Council of Entrepreneurs at the Mayor’s office and the Moscow City Government. On March 26, 2003, he was appointed a Vice-President of the Russian Finance Union. On August 22, 2003, by the decision of the Permanent Premium Commission at the Russian International Register of the complex medicine “ENIOM” Grigori Grabovoi was awarded the title of “The Best Healer of the III Millennium”. On November 14, 2003, Grigori Grabovoi was awarded the public order of the Twice Hero of the Soviet Union of Honored Test Pilot of the USSR Beregovoi G. T. for his great contribution to flight safety of aerospace technology. On June 21, 2004, in accordance with the decision of the Presidium of the WSA Grigori Grabovoi was elected an Honorary member of the World Scientific Association. On October 10, 2004, the Federation of Russian Cosmonautics awarded Grigori Grabovoi the medal named after Academician Sergey Repiev for the services to national space. On October 24, 2004, European Academy of Natural Sciences in Hannover awarded Grigori Grabovoi the medal Robert Koch. On December 15, 2004. The Academy of the Problems of Security, Defense and the Rule of Law elected Grigori Grabovoi a full Academician of the Academy. On December 15, 2004, The Academy of the Problems of Security, Defense and the Rule of Law awarded Grigori Grabovoi the Diploma of Professor of the Academy. On January 29, 2005, the International Professional Medical Association of Specialists of Traditional Popular Medicine and Healers “EONIM” awarded Grigori the Golden Badge “ELITE” for special merits in the field of creation, application and introduction of new technologies and devices in traditional medicine. On August 26, 2005, Grigori Grabovoi was awarded the Order of Peter the Great of the 1st Degree for the merits and substantial personal contribution to the development and strengthening of the Russian State. On December 26, 2006, by the decision of the Commission Grigori Grabovoi was awarded the medal “For Devotion to Aviation”. Grigori Grabovoi was registered as the author in Copyright Society of GFR VG WORT. The registration data are as follows: No 1103135 of September 30, 2011 are available on the official website www.vgwort.de , page https://tom.vgwort.de. The documented results of Grigori Grabovoi on the accurate extrasensory diagnostics and anticipating forecasting, on control of events by means of generation of bio-signals and emanation of thoughts are described in the books “The Practice of Control. The Way of Salvation.” volumes 1, 2, 3 (www.ggrig.com/control-practices-1-6). The documented results of people who practice the Teachings of Grigori Grabovoi are described in the books “The Practice of Control. The Way of Salvation.” Volumes 4, 5, 6 (www.ggrig.com/ru/control-practices-1-6).